I first fell in love with the sport of horse racing after I had the chance to visit Churchill Downs during spring racing season a few years ago when I had a college internship in Louisville, KY. It is now on my bucket list to attend the Kentucky Derby someday! Anyways, what I didn't realize before my recent holiday trip to Georgetown, KY was that it's not just Louisville that is famous for racing in horses. 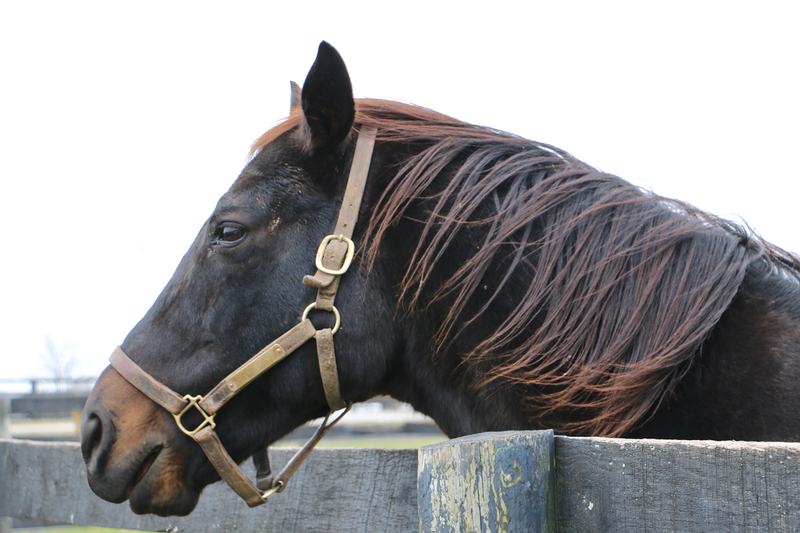 Lexington, Kentucky's second largest city, is actually known as the Horse Capital of the World! 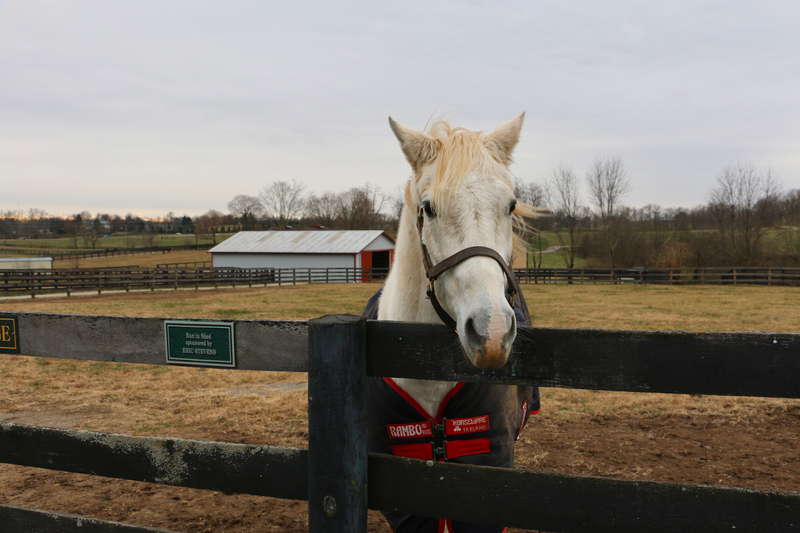 Georgetown, the charming town that I got to visit with my friend Kylie from Dress in Sparkles, is under 30 minutes from Lexington, and the outskirts of the town are filled with scenic horse farms! 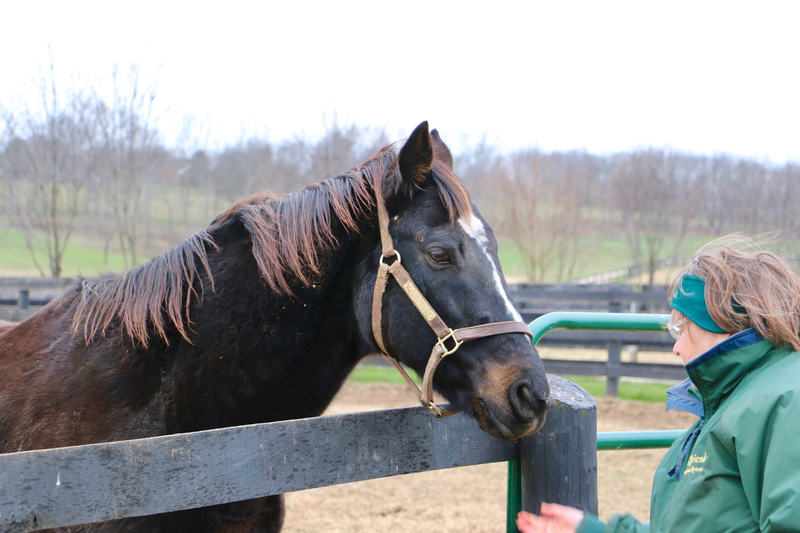 One such farm is especially special; Old Friends Thoroughbred Retirement Home. Kylie and I had a chance to visit this unique place during our trip, and although the weather wasn't in our favor, it was still a highlight of our time in Georgetown! Today I'm so excited to share more about our morning at Old Friends. 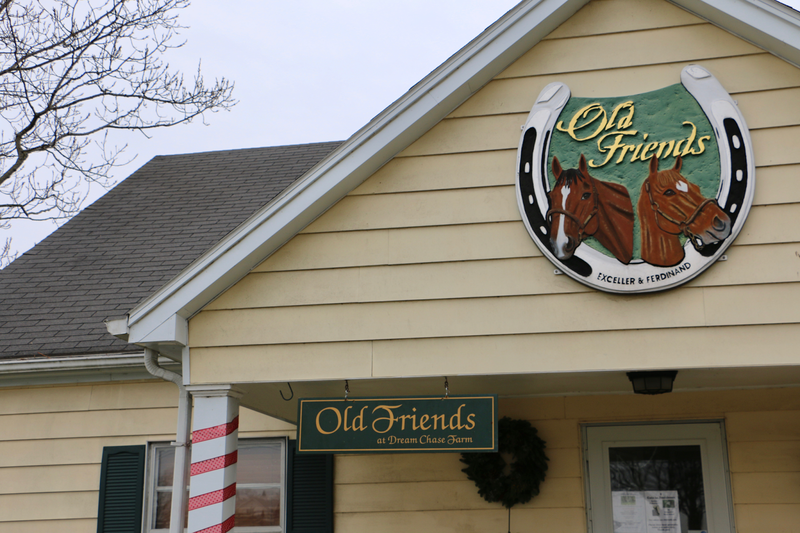 Old Friends was founded in 2003 as a retirement farm for Kentucky's race horses. 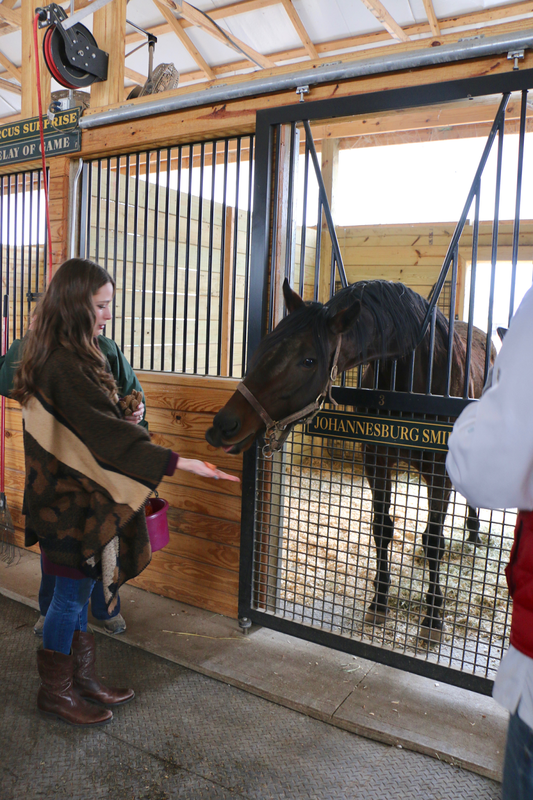 Today, their Georgetown farm has grown to house over 175 horses! They also have two additional smaller Old Friends farms, another location in Kentucky, and one outside of Saratoga Springs, NY. They are a non-profit and receive no federal funding to stay in operation, so they rely solely on donations, grants and revenue from tours and their gift shop. 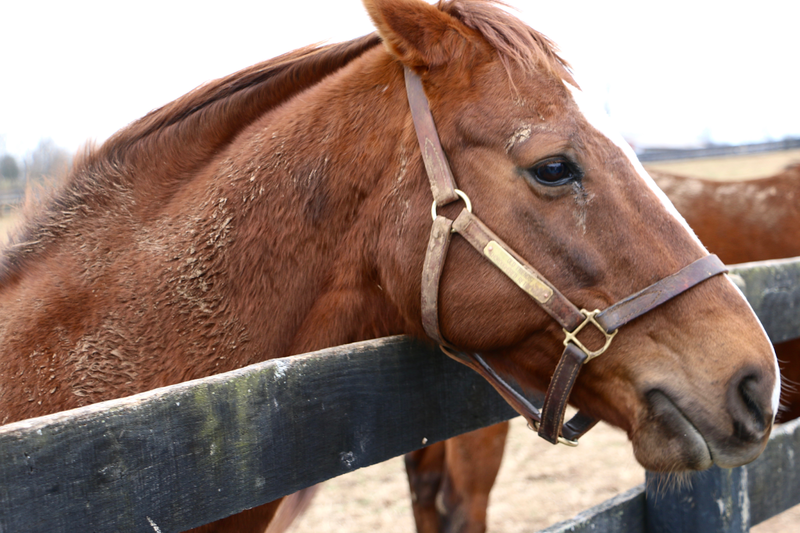 I think it is so incredible that a farm like Old Friends exists to give retired race horses a place to live out the rest of their lives in peace after their racing and breeding careers have concluded. Kylie and I were so excited to see the farm in person. 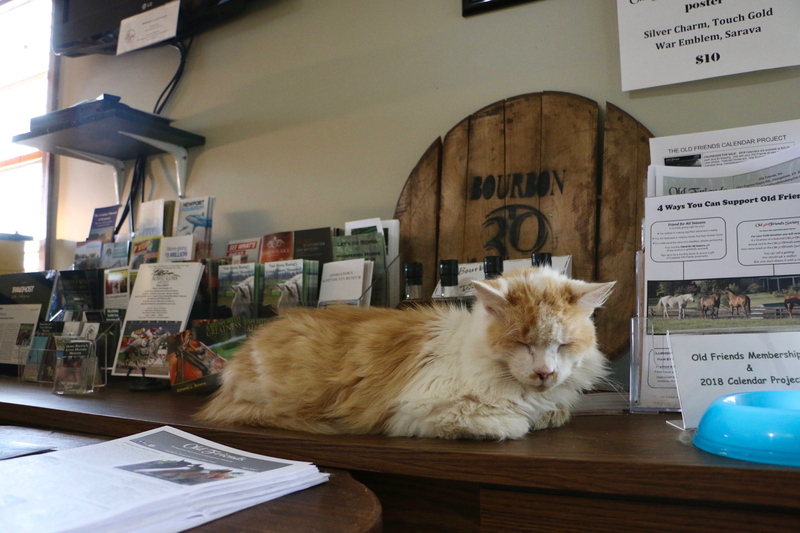 You check in for tours at Old Friends in their welcome center and store. They have several house cats which love to greet visitors, which I thought was adorable! (I'm sadly allergic to cats so I couldn't pet any of them, but they did seem friendly!) Kylie and I arrived early, so we enjoyed browsing the shop and looking at all of the horse and racing related gifts and apparel. Next it was time to hit the farm grounds for our tour! Old Friends runs tours a few times a day during their peak season (April-October), but on winter weekends they run only once a day. 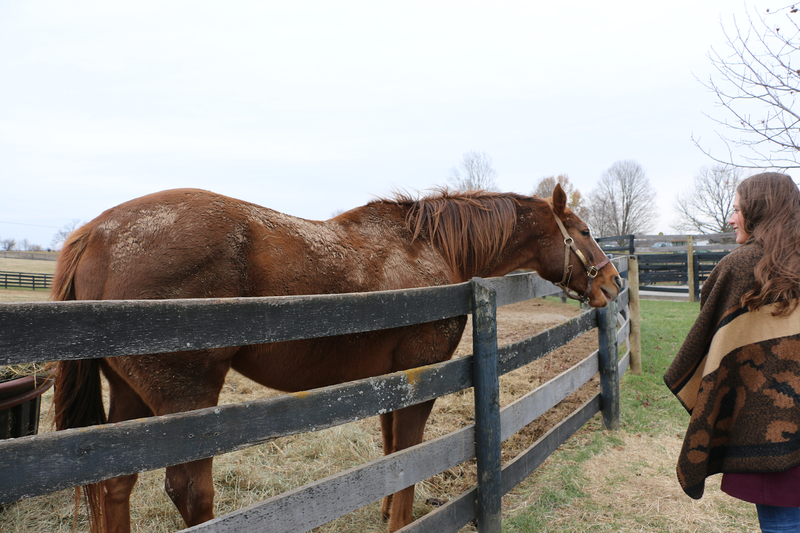 Our tour guide, Beth, told us that the horses would be extra excited to see us since they have less visitors in the winter! 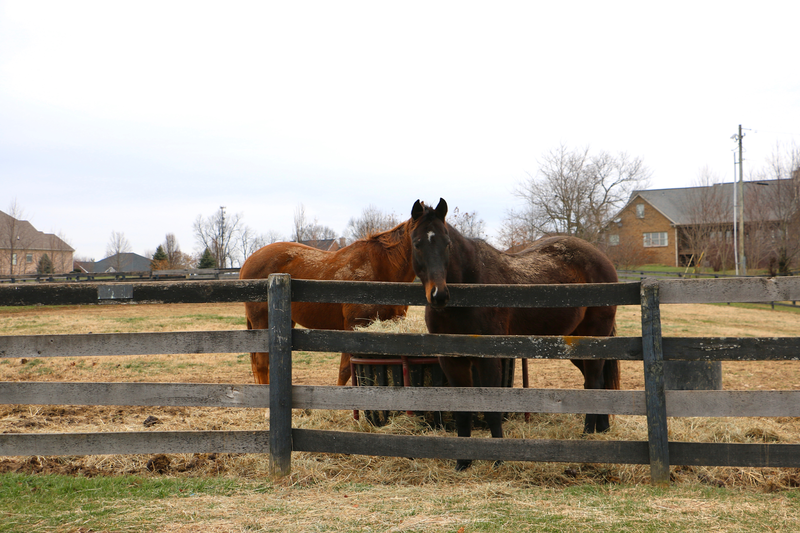 Old Friends tours are done on foot, and you have the chance to walk most of the grounds of the large farm, and visit a lot of the horses in their enclosures. Most of the stallions do not like to be petted, but they are all friendly enough horses that you can feed them carrots with your tour guide. The horses sure did get excited when they saw Beth's carrot bucket- it was the cutest thing! Some of them opened their mouths and nodded their heads when they'd see our group walking towards them. Next are a bunch of pictures of some of the "new friends" I met at Old Friends! Our tour guide, Beth, showing us the proper way to feed the horses carrots in the photo above! Here are pictures of my two favorite horses that we saw! 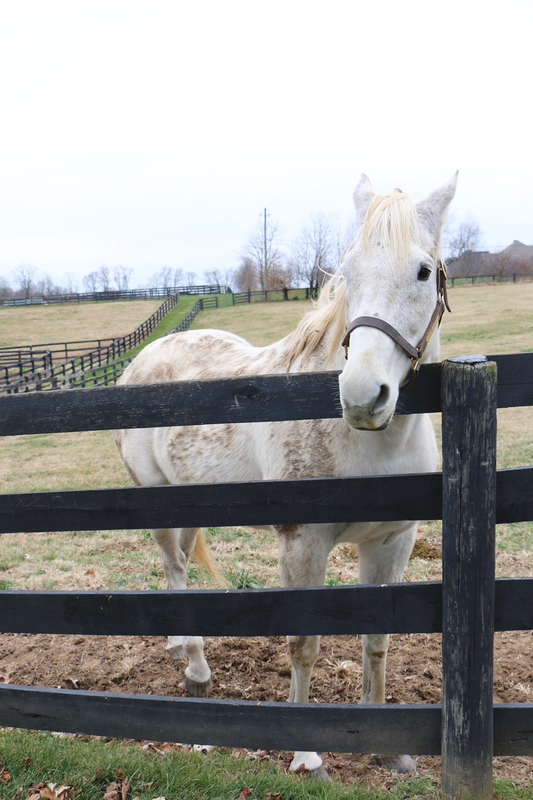 Silver Charm (the large white one) was the 1997 Kentucky Derby winner. 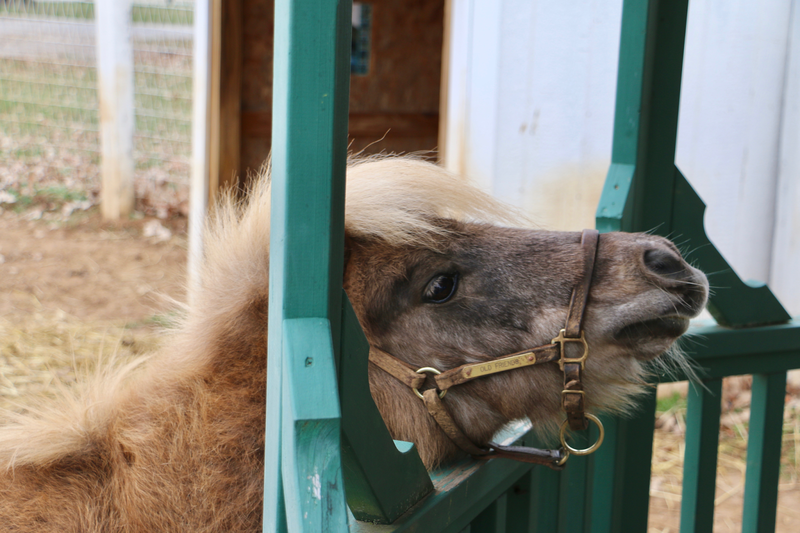 Little Silver Charm (the small one, not related to Silver Charm) was the very first horse that Old Friends took in, and now serves as the mascot of the farm! 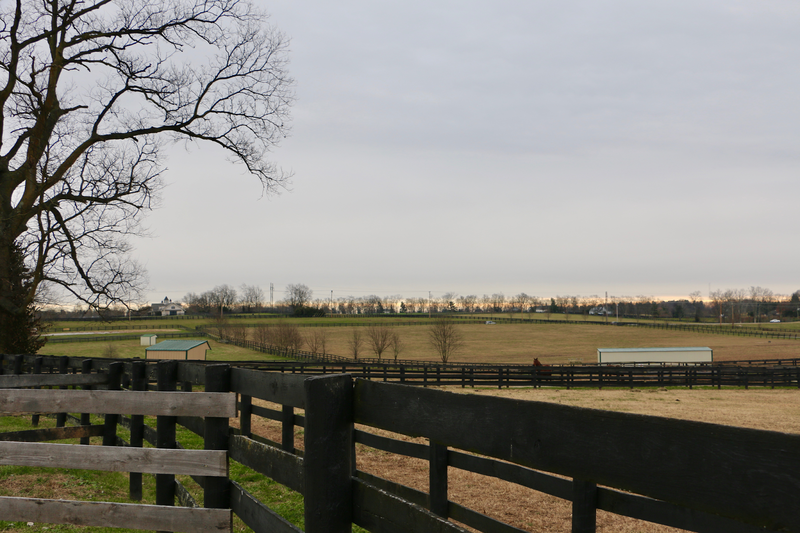 Lastly, a few pictures of the grounds of Old Friends to show you just how large and beautiful this farm is! What an idealistic place, filled with meadows and big skies. Kylie and I were absolutely delighted by our tour of Old Friends- however I must address one thing before finishing this post. The weather could not have been any worse. Kentucky was experiencing a severe cold snap while we were there, and the coldest part of the trip was the morning we toured Old Friends. It was in the 20s, but with the wind chill (and in an open space like a farm there's LOTS of wind) it was definitely in the teens. It was a cold unlike anything I've ever experienced.... and that's coming from someone from Maine, and who now lives in Vermont! Despite wearing a peacoat, gloves, and boots, my entire body was numb when the tour ended. Beth kindly took the other people on the tour with us for the extended version of the tour to visit some more horses after the regular tour ended, however Kylie and I were too frozen to continue. I wish we could have!! I feel like had we visited Old Friends on a day when the weather was more tolerable our visit would have been even more magical. Old Friends Farm in Georgetown is open for tours year round. Admission is $10 for adults, and you can book tours online on their website. If you're in the Georgetown or Lexington area- I highly recommend a visit to this peaceful and special farm. We found it well worth it, even in the coldest and most miserable weather! Stay tuned for more posts about the trip and a Georgetown travel guide next week! This post was written in collaboration with Georgetown/Scott County Tourism. 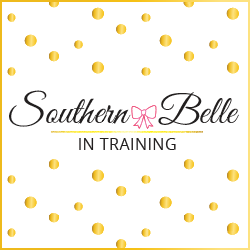 Thank you for supporting the organizations that work with Southern Belle in Training! What a fun visit! It looks like a ton of fun - your pictures are gorgeous! Such a bummer that it was so cold; those days are always rough in KY! This is so neat! I wish I had heard of it before we moved out of KY! And the cold.... it's so unreal! I tell everyone here in Iowa it's warmer here than in Kentucky because the humidity causes the cold to just sink in your bones! I love horses and loved seeing your pictures of them. Thanks for sharing! Sounds so fun! Everyone thinks I ride a horse everywhere because I'm from TX haha. I love horses! They are adorable and sweet! Such a great trip! Sorry it was so cold! But it looks and sounds like this is an awesome place! Despite the weather it looks like a cool adventure! OMG, it looks and sounds like such a fun place to visit. Glad you guys had a good time! Oh my gosh, so sorry the weather was not as great but looks like an awesome and unique opportunity! This is so cool! I want to go! Horses are just so beautiful. Bummer it was cold. What a beautiful visit! I love horses but never visited a horse farm, I’d love to go! I've only rode/chilled with horses a few times, but I absolutely love them! Such beautiful animals. I would love to go here! Those horses are beautiful!